The Simpsons are busting out the bindings in one of their wackiest books yet, and no one is safe from their maniacal comic madness! See Grampa Simpson, Bart Simpson (a.k.a. 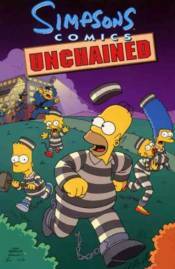 El Barto), Homer, the Comic Book Guy and local celebrity Krusty the Clown act out their wildest schemes in the new comic collection--"Simpsons Comics Unchained."